This month Atlanta Curb Appeal wrapped up a major renovation in Dunwoody, Georgia. The end results were stunning! We interviewed Avi Moyal (owner) about the project. How did they find Atlanta Curb Appeal? This young couple found me online. They collected bids from several contractors and selected Atlanta Curb Appeal to handle their first home remodel. When I asked them (near the end) what made them pick us, they responded that we were the only ones that foresaw future problems and elements that might not work together and that we seemed like we would actually be able to deliver the results they wanted. Secondly, the couple felt like we offered the best design solutions and that we conveyed the impression that we knew what we were talking about compared to the other guys. What steps had to be taken to complete the job? First we gutted the couple’s master bathroom plus another hall bathroom. Then we removed the old hardwoods and carpets. After this demolition, we basically started from the ground up and rebuilt both baths. We replaced all plumbing in the master bathroom, under the floor and in the walls, it all had to be relocated to fit the new design of the room. 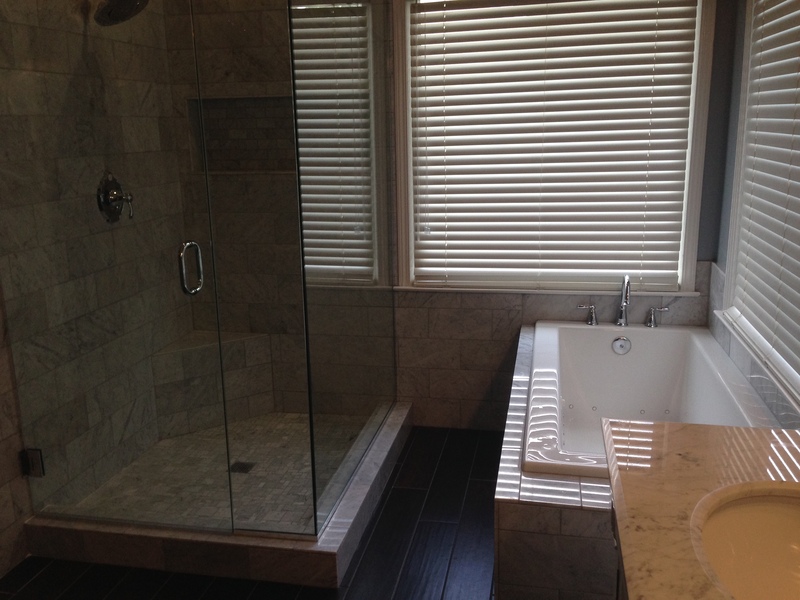 Furthermore in the master, we added a new larger shower area along with new tile, frameless glass doors and a long wide soap niche. 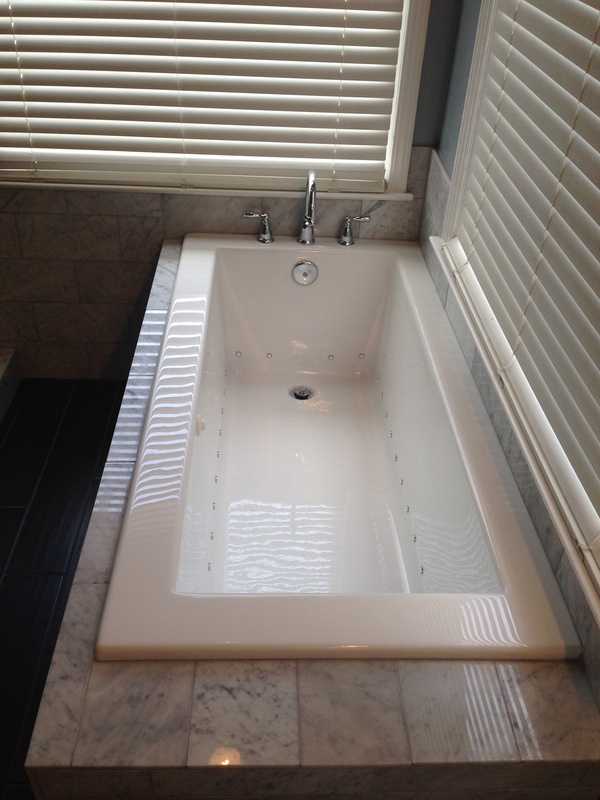 Plus we installed a new air tub, new vanities, new fixtures and finally new tile on the floors. 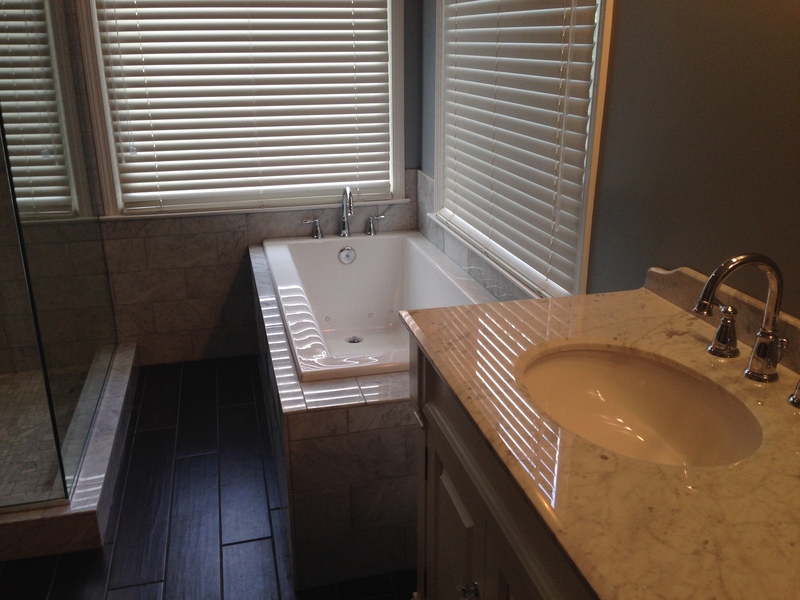 The master bath was a formidable project. It took a bit more time than we expected because all the walls and corners were off, they were neither straight nor parallel. It took extra efforts to make the tile lines appear symmetrical. The original flooring was also off-balance and had extreme “sagging” issues. To compensate we had to level it with three different techniques to get it to our level of perfection. What other rooms did you remodel? We painted the interior; bedrooms and living room with very modern colors that the client picked, and it turned out beautifully. In the kitchen, we added a new backsplash, painted the cabinets and walls and replaced the hardware. For the living room, we added new tile around the fireplace. Also throughout the house, we installed new-engineered hardwood floors on the main level. What do the clients think of Atlanta Curb Appeal’s work? The clients are overjoyed with the outcome. As you can see from the pictures, the results are like something out a magazine! Again and again, customers find our construction to be well done and solid. Our attention to detail has many clients coming back for more projects after they experience the quality of our work. We are so grateful we get to help homeowners’ turns their dreams into reality. 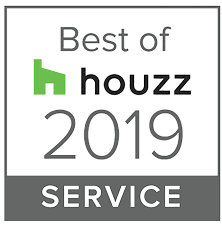 If you have a bathroom or kitchen-remodeling project in East Cobb, Sandy Springs or the surrounding areas that you would like to get a free estimate for, call us today 770-778-1172. 1. Keep the same layout or expand? If the work requires a partial or full demolition, it’s a good idea to explore all of your options and possibilities. 2. In the shower, consider adding soap niches and/or a bench. 3. Consider tiling the walls all the way to the ceiling in the shower. 4. What kind of a door do you want for the shower? 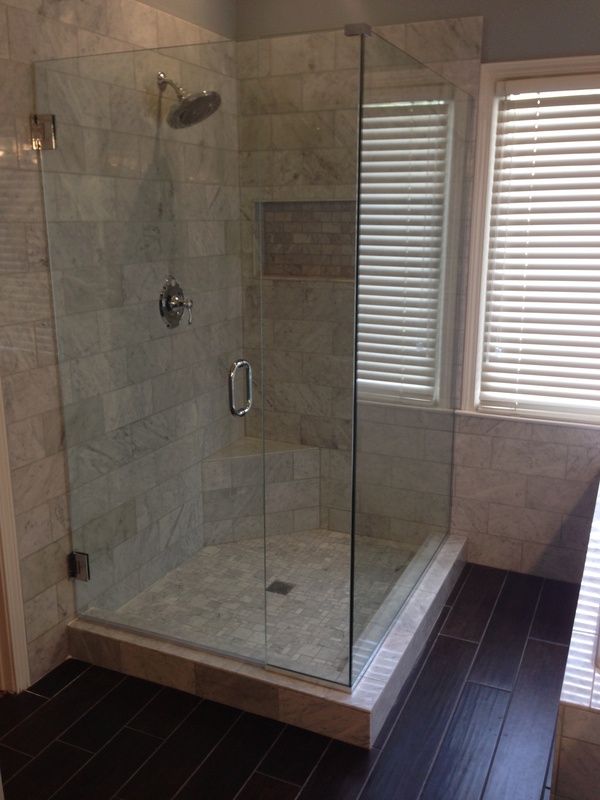 These days, the majority of our customers choose a frameless glass door (as shown in picture at top). 5. Add some accent tile in the shower walls and floor. You can also tie it to the vanity backsplash for consistency. 6. 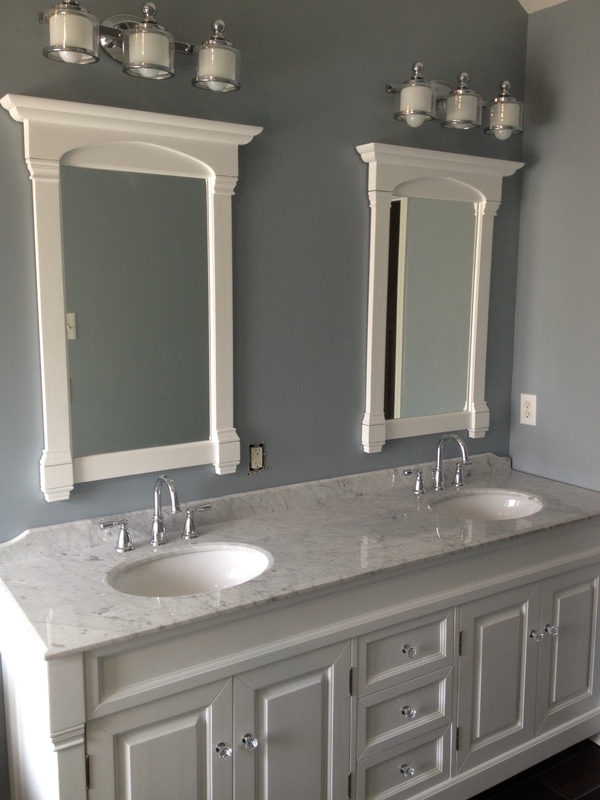 What style do you want for the new vanities, new mirrors and new light fixtures? 7. Consider backsplash around your bathtub. 8. Replace the bathroom window. Older windows date the room. 9. Make sure you have enough light by the vanities and in the shower. 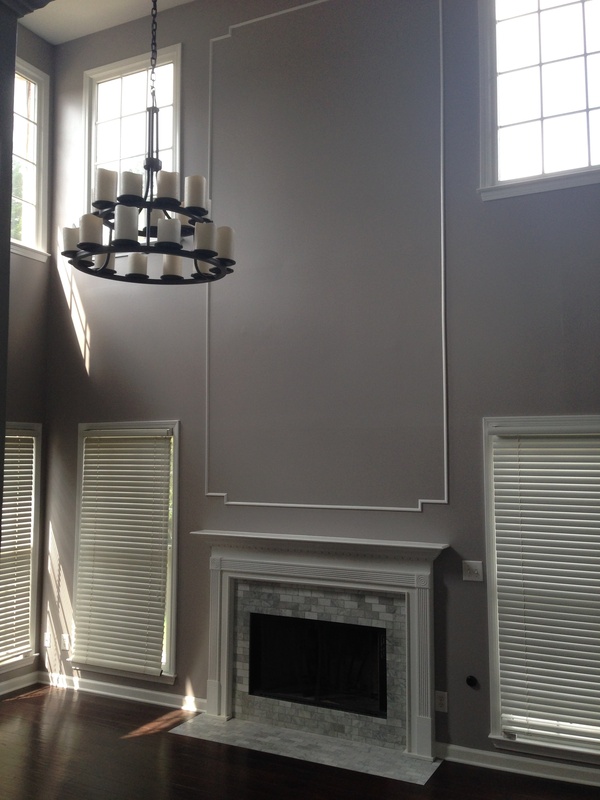 Recessed can lighting is one option. 10. Don’t forget a good quiet venting system.